Sony Electronics’ new α77 II camera delivers an impressive combination of speed, versatility and efficiency in a tough, weather-resistant design, making it a perfect choice for fast-action photography and videography. Building on the heritage of Sony’s much-loved original α77 and α700 cameras, the α77 II gives advanced amateurs a string of exciting enhancements including the world’s highest number of AF points in a new phase detect autofocus system1 with 79 focal points and 15 cross points. Utilizing Sony’s unique Translucent Mirror Technology, the α77 II also has the ability to shoot at up to 12 fps for60 total frames with continuous AF. The speedy new camera is equipped with a high-resolution 24.3 MP image sensor and powerful BIONZ® X processor, ensuring that still images and full HD videos are captured in sharp focus and incredible detail. Image quality compared to the original α77 has been boosted, and sensitivity has increased by approximately 20% as well. There is also a variety of new pro-friendly video functions for movie makers. The advanced AF system on the new α77 II camera features 79 phase detection AF points – the most of any dedicated AF sensor in market today – and includes 15 cross points within the central area of the sensor. Additionally, metering data from all 79 focus points is processed by a brand new AF algorithm that predicts the subject’s movement. These impressive new features combined with Sony’s powerful Translucent Mirror Technology ensure that fast-moving people, animals or any other relevant object can be tracked quickly and accurately in all types of shooting conditions. The α77 II camera also has a centrally mounted dedicated phase detect AF sensor that supports apertures up to F2.8, ensuring maximum AF precision when using large-aperture lenses. In low light, the AF system of the camera performs admirably, accurately locking on to subjects in scenes with illumination levels as low as EV-2 (ISO100), where even the human eye has trouble discerning details. For even greater control, the degree of subject-tracking duration can be fine-tuned in five steps (when shooting still images in AF-C mode). A low setting is ideal for slow-moving subjects with predictable movements, while high settings deliver more responsive focusing for shooting different subjects at different distances, such as wildlife or sports photography. AF Tracking Duration can also be selected between High, Medium and Low during Full HD movie shooting. Other new features include an Eye AF function that precisely detects and focuses on the subject’s eyes when photographing people. There is also AF Range Control, which allows AF to be limited to a specified range, and a Balanced Emphasis mode that provides the ideal balance between focus and release timing. Users can manually select any of the various focus modes to match the shooting situation and their creative objectives. Continuous shooting stamina on the α77 II camera outpaces nearly all cameras in its class as well as many professional cameras. The new model can capture a non-stop burst of up to 60 full-resolution JPEG images at a maximum continuous shooting speed of approximately 12 frames per second with continuous AF (in Continuous Advance Priority AE mode). A showcase of Sony’s leading image sensor technologies, the new 24.3 megapixel Exmor® CMOS image sensor in the α77 II camera features the same gapless on-chip lens structure as used in the acclaimed α7R and α6000 models. Thanks to an array of latest-generation imaging innovations, the sensor now offers 20% greater sensitivity than its predecessor (α77), and ensures flawless image detail and low-noises performance across the wide sensitivity range of ISO 100 to 25600. The high-resolution sensor is partnered by the same evolved BIONZ X image processor introduced in the α7 and α7R models. Around three times faster than Sony’s previous BIONZ engine and optimized for the α77 II camera, it employs detail reproduction, diffraction-reducing and area-specific noise reduction technologies that contribute to amazing image definition and rich colors for still images and Full HD videos. The new camera features a crisp, bright XGA OLED Tru-Finder with 236,000 dot resolution. With about three times higher contrast and resolving power compared to the original α77, the EVF on the new α77 II shows the effects of all settings adjustments in real-time, accurately displaying what the final image will look like. A wide viewing angle and high eye-point are complemented by a newly-expanded choice of brightness settings, and shooters have the ability to manually adjust color temperature for comfortable, accurate composition. As featured on the full-frame α99 camera, the α77 II model also features a detail-packed 3.0-type (7.5 cm) Xtra Fine LCD that moves three ways for added convenience. The LCD also features WhiteMagic™ technology, which significantly improves screen visibility, even outdoors in direct sunlight. Evolved from the original α77 model, there are separate control dials on both sides of the grip for simpler control settings adjustments. 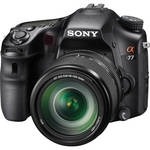 In total, the α77 II camera has a total of 11 customizable buttons with up to 51 assignable functions. Further, up to three frequently used groups of shooting modes and other settings can be stored in memory and recalled easily via the mode dial, and an exposure mode dial lock function has been inherited from the a99 model to prevent accidental mode changes. The tough, light magnesium body of the α77 II camera is engineered to withstand the demands of the most serious enthusiasts. It features a dust and moisture sealed design and a large, contoured grip for comfortable handling. In addition, the camera’s durable shutter unit is rated for 150,000 total shots. The α77 II camera can record Full HD 60p and 24p movies using the AVCHD 2.0 format. As with still shooting, Translucent Mirror Technology enables full-time phase-detection AF, ensuring accurate focus tracking with fast-moving subjects during video capture. On-board Wi-Fi allows one-touch connection for easy shot sharing with your Xperia®, NFC-compatible Android™ smartphones, tablets and VAIO® computers. A single touch also activates Smart Remote Control, linking the camera to your mobile phone enabling you to fire the shutter from a distance. Covering focal lengths from wide angle to telephoto, a family of 32 A-mount lenses offers an extensive choice of creative tools for visual expression, including several premium models from Carl Zeiss® and G Series Lenses. The new α77 II camera is compatible with a range of versatile α accessories including microphones, flashes and more, and is designed to work the optional VG-C77AM grip, which enhances camera operability and versatility during vertical shooting. Sony has also released a new photography-themed “α Library” application for tablets. This new app showcases the entire lineup of α lenses, including key information and specifications, in the “α Lens Catalog” section, and also includes access to a semiannual “α Magazine” lifestyle publication that showcases fun photography content. The new α Library is now available for download on Google Play and the iOS App Store. The Sony α77 II interchangeable lens camera will be available in June 2014 in a kit with a 16-50mm F2.8 lens (model SAL1650) for a suggested retail price of $1800. It will also be offered separately as a body for a suggested retail price of $1200. The new camera and all compatible lenses and accessories will be available at Sony retail stores (www.store.sony.com) and other authorized dealers nationwide.